The Digital Islamic Humanities Project, a signature initiative of Middle East Studies at Brown University, is pleased to announce its annual scholarly gathering, a workshop on the topic of print culture in the early modern and modern Middle East. 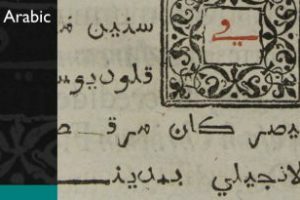 The event is organized in partnership with Gale Publishers, which will present its new digital text archive entitled Early Arabic Printed Books from the British Library. The archive is based on A. G. Ellis’s catalog of the British Library’s collection of early printed materials from the Arabic-speaking world, and contains approximately 2.5 million pages from historic books on diverse genres, including literature, law, mathematics, medicine, geography, and other topics. The workshop will include a featured lecture entitled Towards a New Book History of the Modern Middle East by Dr. Kathryn Schwartz, Postdoctoral Fellow for the Digital Library of the Eastern Mediterranean at Harvard University.